As the Russian intervention in Syria intensifies the chaos in Turkey’s neighbourhood, Turkish politics are becoming more unstable. The two explosions that went off in the capital city of Ankara took place right across from the train station, a landmark soaked in republican symbolism. The bombing took a high toll on peaceful demonstrators, who were on their way to a central meeting place to protest the violence in the country and demand peace. 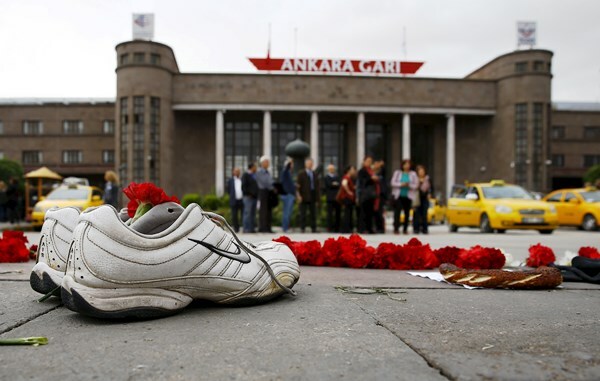 A pair of shoes, belonging to a street vendor who was selling Turkish traditional bagel or simit, is placed at the bombing scene during a commemoration for the victims of Saturday’s bomb blasts, in Ankara, Turkey, October 12, 2015. These explosions arrive on the heels of the ones in Suruç, on the Syrian border across from Kobani in July, and in Diyarbakir just before the general elections in June. What is driving this violence? What are the implications for the West? And, will Turkey be able to come out of it? High-stakes electioneering— combined with developments in Syria— are fueling this instability and violence. Parliamentary elections held this June yielded results that threatened to bring the governing Justice and Development Party’s (AKP) 13-year reign to an end. It happened against a background of increasing authoritarianism in the country, growing economic difficulties, and deep entanglement in Syria’s civil war. The failure to draw lessons from the election results and seek reconciliation through a coalition government eventually necessitated repeat elections, now scheduled for November 1, 2015. 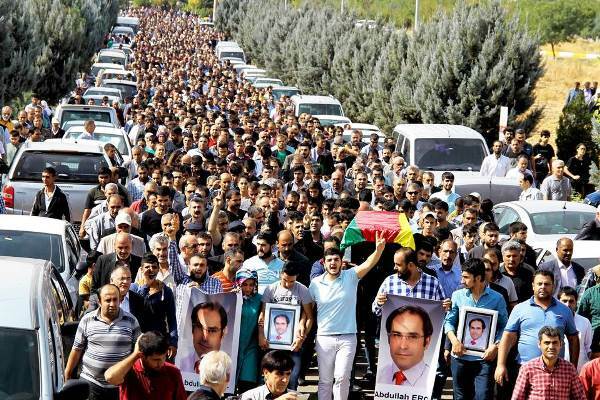 The endless fighting between security forces and the Kurdistan Workers’ Party (PKK) has also laid bare the Kurdish community’s frustration with the AKP leadership. They allege that the AKP has betrayed them by abandoning the peace process with the PKK. They also claim that the government has supported the Islamic State (IS) in Syria against their brethren there. Meanwhile, a growing number of secularists, liberals, and members of the middle class now oppose the AKP. The explosions in Ankara are symptomatic of the above concerns and the deep polarisation in the country. 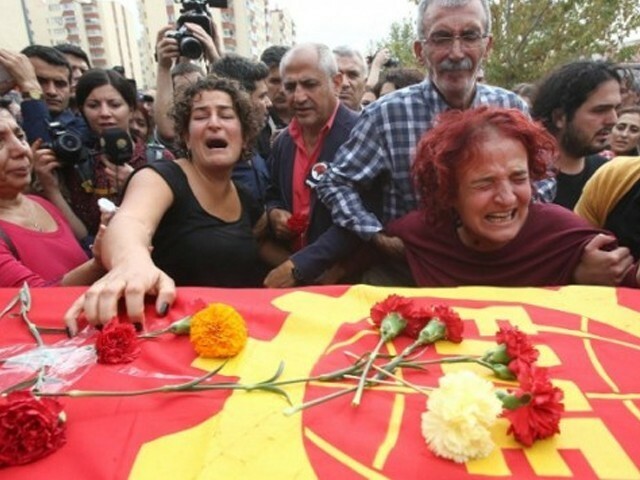 Accusations have been flying in all directions – Many are now pointing the finger at the ISIS affiliates responsible for the Suruç and Diyarbakır bombings. Many government critics are also charging that necessary security measures were not taken to protect the demonstrators. 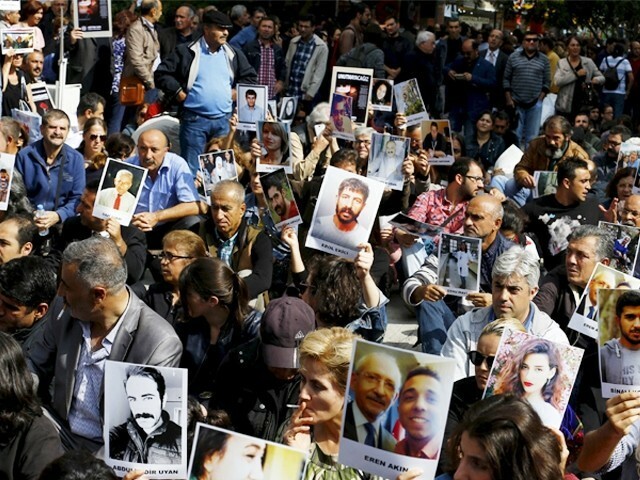 They accuse the government of holding a double standard by deliberately failing to adopt the kinds of measures that it had adopted for similar pro-AKP gatherings. There have been calls for the minister of the interior’s resignation, yet officials have resisted, insisting there were no security lapses — even as the death toll continues to rise. Such an obvious disregard for accountability has even irritated some prominent AKP members. It has also transformed a significant portion of secular Turks into unlikely partners for the Kurdish community, who would otherwise be concerned about Turkey’s territorial integrity being undermined by violence and the PKK. Mourners carry the coffin of Abdullah Erol, a victim of Saturday’s bomb blasts in Ankara, during a funeral ceremony in the Kurdish dominated southeastern city of Diyarbakir, Turkey, October 12, 2015. The explosions in Ankara will have serious ramifications for the upcoming election, though exactly what they’ll be is hard to predict. In the meantime, the current state of polarisation in Turkey is a red flag, including for the western leaders who have, or should have, a stake in protecting Turkey from the deepening chaos in its neighbourhood. 1. First and foremost, it will be critical to ensure that Turkey holds free and fair elections. Any sort of electoral fraud would be interpreted as repression of the national will and would run the risk of aggravating polarisation in the country. It would also undermine Turkey’s western vocation — After all, Turkey’s main democratic credential is that it regularly holds national elections that are, by and large, free and fair. The upcoming vote would be the 17th such election since 1950. 2. Secondly, there should be domestic and international pressure to ensure a credible and serious investigation into what transpired in Ankara; accountability and transparency are, after all, two critical elements of good governance. Actually, these are the very values that had once made the AKP a beacon of liberal democracy, economic growth, and stability in Turkey’s neighbourhood, even prompting President Obama in 2009 to call Turkey a model for the region. This time around, transparency and accountability might help the AKP renew its mandate to govern Turkey. 3. 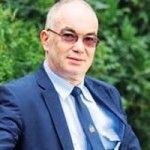 Thirdly, at a time when Turkey is facing Russian intrusions into its territory and the situation in Syria risks becoming even more aggravated, Turkey’s western allies should display solidarity. This is especially important since recent polls show that the Turkish public is once more advocating closer relations with the EU, the United States, and NATO. A strong expression of western solidarity would help weaken the impact of anti-western populism that some politicians will inevitably resort to during the run-up to the elections. Such expressions of solidarity may also provide a base to bring Turkey and the West into a constructive dialogue to address their common foreign policy challenges, such as tackling the Syrian refugee crisis as well as finding a political solution to the civil war in Syria. Turkey is at a critical juncture. It is hard to believe that the very political party that once gave Turkey a taste of liberal democracy, along with untold prosperity and stability, is failing— or refusing— to adhere to the very values it once championed. Repairing the damage done will not be easy or quick. In fact, Nobel-winning author Orhan Pamuk recently expressed his fear that ‘Turkey could drift into a civil war’. Ultimately, the power to shape the country’s future trajectory rests with the Turkish electorate. In the meantime, the West would be well-advised to stand by Turkey and its democracy. It should help ensure that the elections on November 1st truly reflect the national will of the country. A Turkey shaken by explosions, growing chaos, and instability would benefit no one—neither the neighbourhood, nor the West, nor Turkey itself. This post originally appeared on Brookings here. Definitely Turkey has numerous big problems.Mega, mega problems. anyone and his brother to cross into Syria to fight Assad’s forces? Yep, it is. Is this the same Turkey that is screaming for help, from everyone? Yep, it is. Ayesha Siddiqa, a renowned columnist, in he recent article taunted India for becoming like Pakistan, many disagreed and rightly so. If any country that increasingly looks like Pakistan, it’s undoubtedly Turkey. Perhaps,Turkey went a bit farther, because Nawaz Sharif didn’t ask Pakistani women not to laugh in public, not so far, at least.